The College of Medicine has always been a recognized leader in social accountability; our Social Accountability Committee was established in 2004, leading to our Division of Social Accountability, created in 2011. This team has been ably led by Dr. Ryan Meili and is best known for its Making the Links program, which educates students in advocacy and provides them with experiences in local and global socio-economically deprived communities. This year, we have added resources to the division to allow for the expansion of Making the Links and the addition of an Indigenous stream. I challenged Dr. Meili to develop a plan for advancing social accountability at the College of Medicine to the next level. He has consulted widely over the last six months and is now ready to bring forward that plan, the College of Medicine Social Accountability 2016-2020 Strategic Plan. Just under 100,000 (10.1% of the population) Saskatchewanians were living in poverty in 2010 and 64% of First Nations and Métis children are living below the poverty line in our province (Plante & Sharp, 2014). On March 21, we were fortunate to have Dr. Robert Woollard, Professor of Family Medicine from UBC, former chair of the Committee on Accreditation of Canadian Medical Schools and world-renowned scholar and advocate for social accountability, at the college as a guest speaker. Dr. Woollard will assist us as we develop social accountability in medicine in Saskatchewan. Last week, our health science students hosted the third annual Health Innovation and Public Policy conference. We had superb presentations by our own Dr. Kish Wasan, Dean of the College of Pharmacy and Nutrition, Dr. Danielle Martin, Vice-President Medical Affairs and Health System Solutions at Women’s College Hospital and founder of Canadian Doctors for Medicare, Dr. Cindy Forbes, President of the Canadian Medical Association and Dr. Naheed Dosani, Palliative Care and Family Physician at William Osler Health System and Inner City Health Associates, McMaster University. Our students are fabulous role models in advocacy, as demonstrated by their organization of this conference. Physician advocacy is now a competency mandated in the new CanMEDS guidelines. In their article, Building a Generation of Physician Advocates: The Case for Including Mandatory Training in Advocacy in Canadian Medical School Curricula, doctors Tahara Bhate and Lawrence Loh make a compelling argument for mandatory training in advocacy in Canadian medical schools. In a further example of advocacy, one of our own residents was asked on completion of his residency, “What would you change?” He spoke passionately about the numerous times he witnessed both intentional and unintentional racism directed towards Indigenous patients. His courage was impressive and the examples he provided were distressing. I’d like to bring to your attention to an excellent paper by the College of Family Physicians of Canada (CFPC), Health and Health Care Implications of Systemic Racism on Indigenous Peoples in Canada prepared by the Indigenous Health Working Group of the CFPC and the Indigenous Physicians Association of Canada—our own Dr. Veronica McKinney was one of the principal authors. This is a great document for all of us to read and then reflect on what we can do to eliminate systemic racism in health care, and how we teach and act as advocacy role models for our learners. For me, the greatest reminder of how far we have to go came from the authors of the Truth and Reconciliation final report. They wrote: “For over a century, the central goals of Canada’s Aboriginal policy were to eliminate Aboriginal governments; ignore Aboriginal rights; terminate the Treaties; and, through a process of assimilation, cause Aboriginal peoples to cease to exist as distinct legal, social, cultural, religious, and racial entities in Canada.” This quote illustrates so clearly how we got here and how far we have to go in eliminating systemic racism in health care. This past week was all about health research, as I attended two very informative conferences. 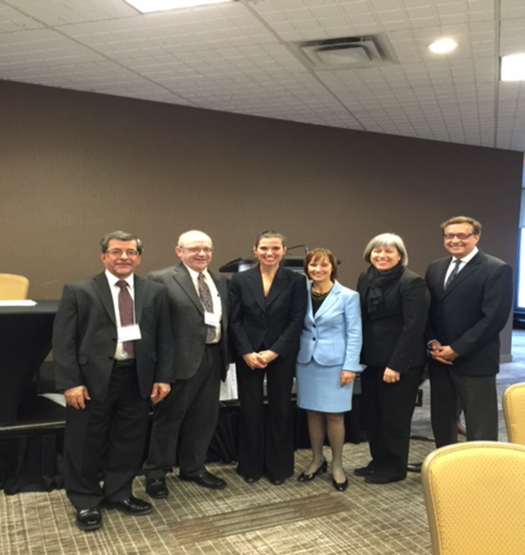 The first, at Western University, was the Consensus Conference on Clinician Scientist Training in Canada. It was hosted by Dr. Michael Strong, the Dean of Medicine at Western and a very well-regarded clinician scientist. He also has an ongoing active research program in Amyotrophic Lateral Sclerosis (ALS or Lou Gehrig’s Disease). Clinician Scientists are those clinicians (MDs in our case, but from all health professions) who have advanced research training (MSc, PhD, CIP) and devote a considerable percentage of their time to research. They may be involved in the full spectrum of research, from the wet lab to population health, or medical education research. Their role as bridge from bedside to laboratory is essential for our health research enterprise. The role of the clinician scientist is a challenging one in a world where competing clinical demands are infinite and research funding is declining. The situation in Canada is dire, according to some observers, given that many established clinician scientists are aging and, just recently, the CIHR withdrew support for MD-PhD programs. The purpose of the meeting was to develop recommendations to enhance the training of and train more clinician scientists. I will be happy to share those recommendations with anyone interested when the report from this conference is completed. The College of Medicine five-year plan and The Way Forward call for the addition of 10 clinician scientists. We are now embarking on some of that recruitment. Our own MD-PhD program has been under-subscribed and we are working with medical students and the research office on its enhancement. However, the greatest thing we can do as a college to support clinician scientists and grow research is changing our culture. The famous old question frequently encountered by these hard-working scientists is from their MD colleagues, who say, “Are you coming to work today or you going to your lab?” Our clinician scientists need our support, and that may be through sharing research ideas, recruiting our patients to trials, respecting protected time for research, and cheering their successes. The next conference, in Ottawa, was the Academic Health Sciences Network National Symposium 2016. This annual meeting is co-sponsored by the Association of Faculties of Medicine of Canada and HealthCareCAN. The latter is an organization of the large teaching hospitals in the country. I have previously blogged about academic health science centres and networks and their crucial role in teaching, research and the success of medical schools. The College of Medicine will never achieve its goals without such a partner. While we’ve made great progress in our partnerships here in Saskatchewan, our healthcare system does not have a membership in HealthCareCAN. Given the tremendous success of the U15, HealthCareCAN has now developed its own lobby group, the H10. The only two unrepresented provinces are Saskatchewan and Alberta. The symposium this year had excellent presentations on the changing political environment, using research to enhance patient safety in teaching hospitals and more discussion on training to support clinician scientists. We also heard from the leaders of the major funding agencies: CIHR, CFI and Genome Canada. Overall, it was an excellent meeting. At the end of the day we had an opportunity to meet Dr. Kirsty Duncan, federal Minister of Science, and lobby for research funding. We were also asked to provide input into the development of a Chief Scientific Advisor position by the federal government. It remains to be seen whether we are entering “sunny ways” for health research but the mood in the room was positive and the consensus was that things were unlikely to get worse! Minister Duncan and colleagues from the AFMC.